It's February 1, and Valentine's Day is just a couple of weeks away. It's high time to do some fun Valentine's decorating. If you're like me, you enjoy decorating for all the little holidays. . . but you don't want to spend much money on decorating for all the little holidays. Unless you have a membership in the Holiday of the Month club, you need to pull together some fun decorations from what you have on hand plus a few embellishments. Here's one of my Valentine's favorites. I know you've seen this kind of thing, but I'll show you how I do it. Grab a glass hurricane. Don't have any? Dollar Tree does. Now pour those candy conversation hearts into the hurricane, covering the plastic cup. Do you decorate for the little holidays? Got any great ideas? Please share! This is precious, I have to try it! The ribbon around the candle really makes it look sweet! Thanks so much! Oh I love the plastic cup tip! Great idea, thanks for sharing. I usually cluster together little vinettes around the house that have red or pink in them & they suddenly turn to valentines decor :-) Take care! Hi Richella! Oh, this is adorable! I love it and I could totally do this. So cute! I am going to have to try that! I kept out my red flameless candles from Christmas just for Valentines! The ribbon around your candle though is just perfect! I love Valentine's Day and all things hearts. Very cute! I'm waiting for a blizzard to hit this afternoon, on top of yesterday's ice, so I don't think I'll be going anywhere for a few days. I'm going to have to see what kind of Valentine decorations I can come up with from stuff I already have. Hi Richella! That is such a cute idea! I hate to admit it, but I didn't do a whole lot of Valentine's Decorating "BB" (Before Blogging) but I have definitely been inspired this year! My sister and I are hosting a Valentine's Sister Saturday party on the 12th and I would love it if you would consider linking this up. :-) We just launched a new blog together so if you haven't been by yet, be sure to come over and take a look! Very cute idea! I like displaying vintage valentines. They can usually be found for little cost. I also like making my own valentines to display. Super cute, I heart the hearts! Great tip and trick there! I have that very same idea but wouldn't you know I forgot to buy the hearts and I think we're going to be snowed in tomorrow. ;) Yours turned out really cute. 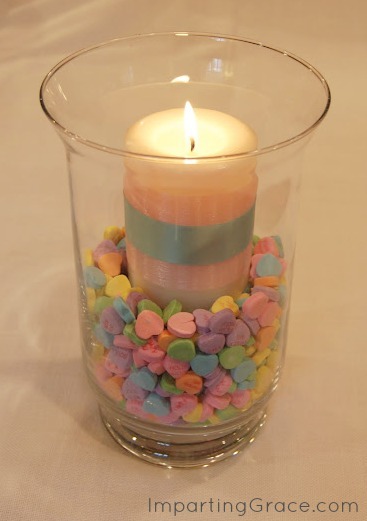 I like how you used ribbon to cover your candle to coordinate with your candy. This is just a perfect Valentine's decoration! Have you noticed that it is hard to find real (Necco) conversation hearts? The Sweet Tart ones don't taste the same to me. I've already eaten two big bags of the Brachs ones. Someone needs to stop me! Finding your blog through several clicks. I look forward to reading more. Have a wonderful week, great job on the valentine decor. Such a neat idea! I've seen it before, but never with the clear bottle inside. I'm headed to the store NOW! This is such a great idea! 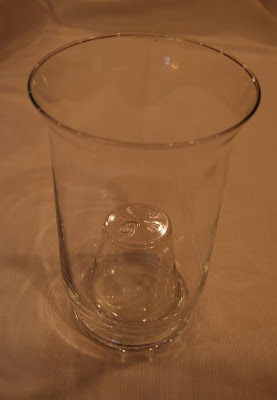 The plastic cup tip is GENIUS! Thanks!